perfect competition with environmental taxes on production, wealth income, wage income and consumption. We simulate the model to demonstrate existence of equilibrium points and motion of the dynamic system. 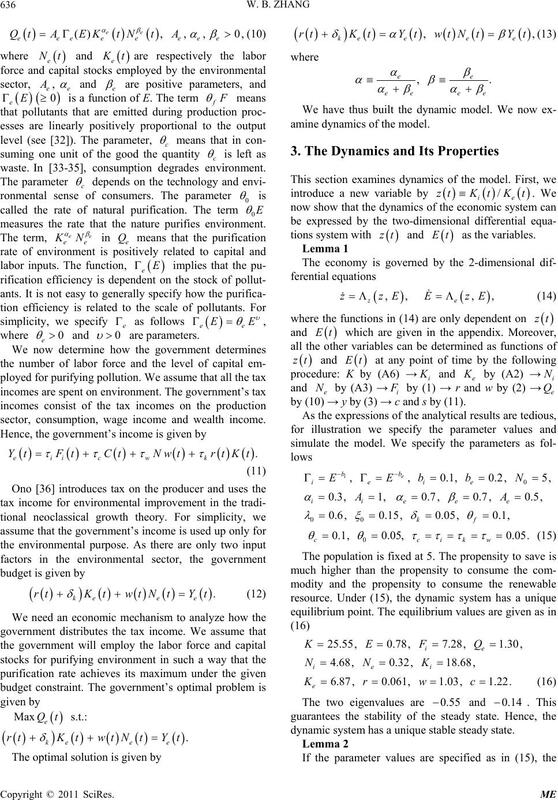 ory Solow model nor by the traditional economic models of environmental change. account of all these effects within a compact framework. similar to the dynamic model by  in many aspects. on firms (outputs), wealth income, and wage income. rameters on the system. Section 5 concludes the study. The appendix proves the analytical results in Section 3.
technological substitutes or complements (see [21-23]). their incomes to consume the commodity and to save. Exchanges take place in perfectly competitive markets. related to income and consumption level. cally meaningful and analytically tractable models. decision on choice of residential location of households. is the sum of the net saving and depreciation. waste. In [33-35], consumption degrades environment. measures the rate that the nature purifies environment. sector, consumption, wage income and wealth income. amine dynamics of the model. zt and as the variables. by (10) → y by (3) → c and s by (11). dynamic system has a unique stable steady state. dynamic system has a unique stable equilibrium. rate of interest falls as the capital intensity is increased. The level of pollution rises initially and then falls. then approaches to the same equilibrium value as before. Figure 1. Motion of the Economic System. Figure 2. 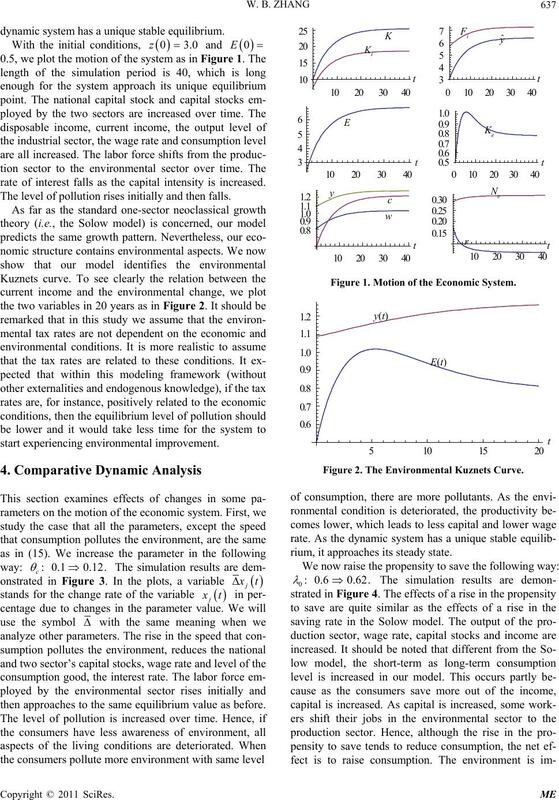 The Environmental Kuznets Curve. rium, it approaches its steady state. the economic system is shifted as illustrated in Figure 5.
improved and the environment becomes better. Figure 4. A Rise in the Propensity to Save. single utility function in the face of one budget constraint. edged. The usual disclaimer applies. 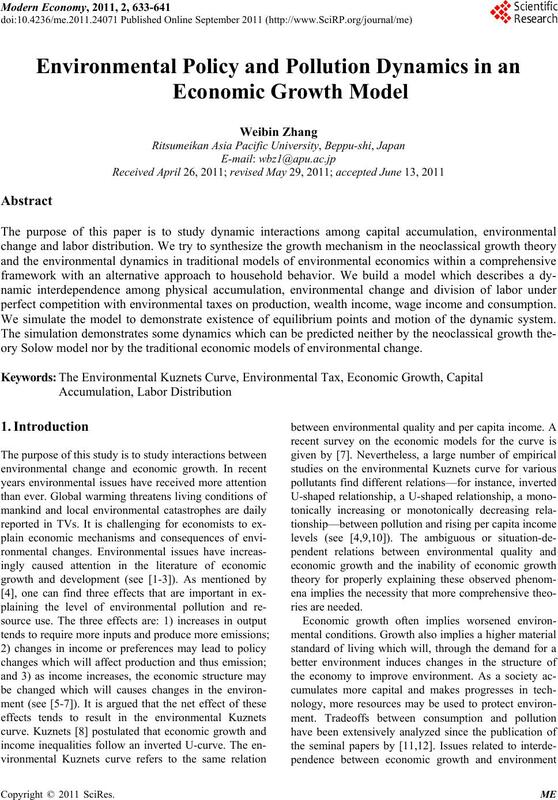 vironment,” Journal of Economic Literature, Vol. 42, No. No. 9, 2006, pp. 1597-1611. Studies, Vol. 11, 2010, pp. 19-36. 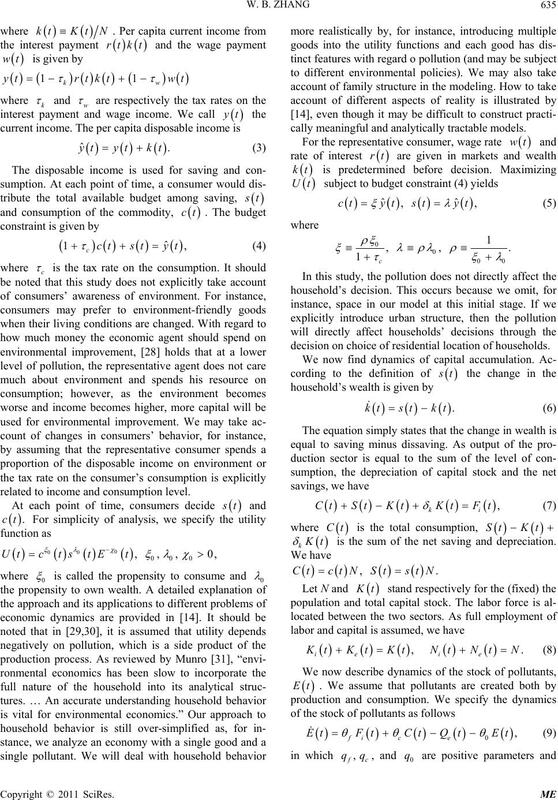 Environment: A Review of Theory and Empirics,” In: S.
survey,” Ecological Economics, Vol. 49, No. 4, 2004, pp. Policy: A Study of Depletion in the Oil and Gas Industry. 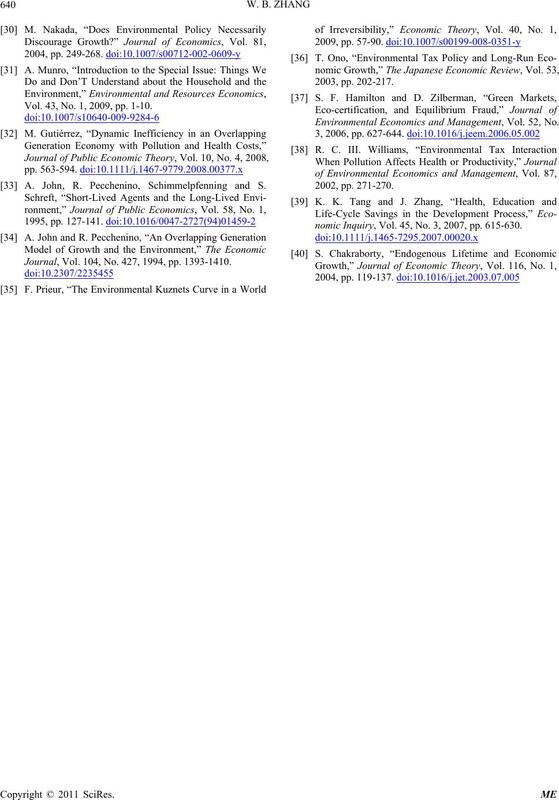 luted Environment,” Economic Record, Vol. 49, 1973, pp. ergy Studies Review, Vol. 6, No. 3, 1994, pp. 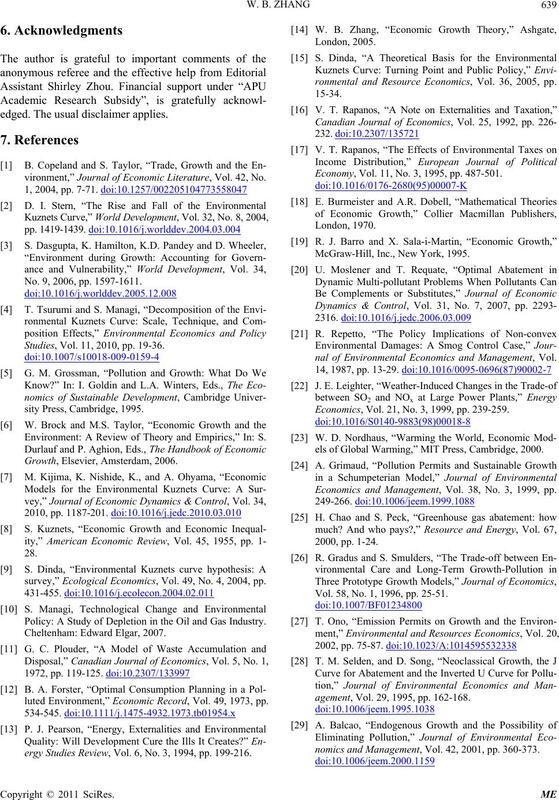 199-216.
ronmental and Resource Economics, Vol. 36, 2005, pp. Economy, Vol. 11, No. 3, 1995, pp. 487-501. 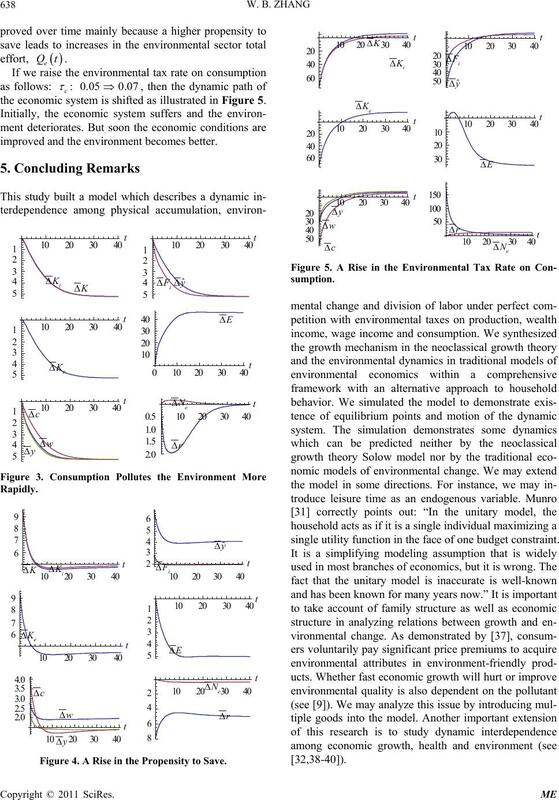 McGraw-Hill, Inc., New York, 1995.
nal of Environmental Economics and Management, Vol. Economics, Vol. 21, No. 3, 1999, pp. 239-259.
els of Global Warming,” MIT Press, Cambridge, 2000. Economics and Management, Vol. 38, No. 3, 1999, pp. Vol. 58, No. 1, 1996, pp. 25-51.
agement, Vol. 29, 1995, pp. 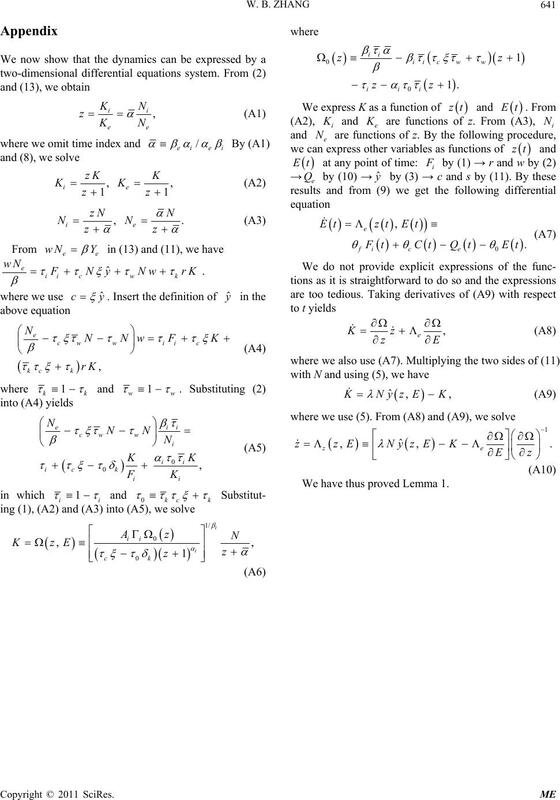 162-168.
nomics and Management, Vol. 42, 2001, pp. 360-373. Vol. 43, No. 1, 2009, pp. 1-10. A. John, R. Pecchenino, Schimmelpfenning and S.
Journal, Vol. 104, No. 427, 1994, pp. 1393-1410. 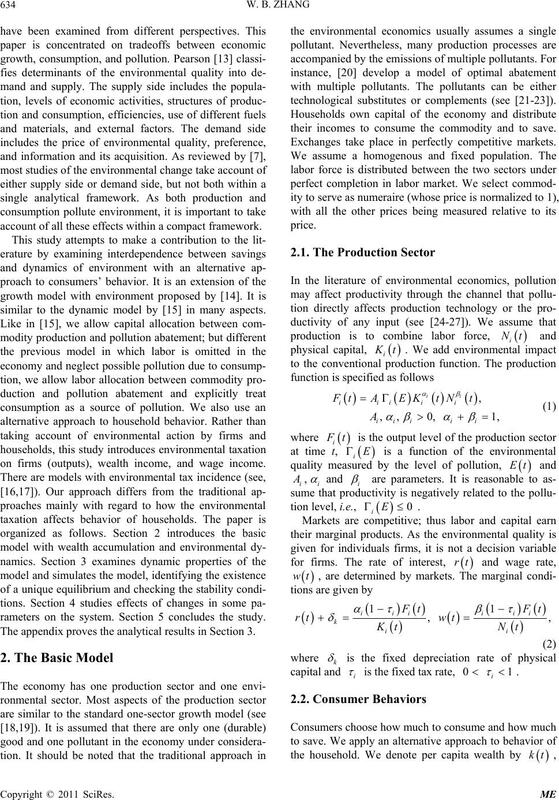 Environmental Economics and Management, Vol. 52, No. nomic Inquiry, Vol. 45, No. 3, 2007, pp. 615-630. We have thus proved Lemma 1.